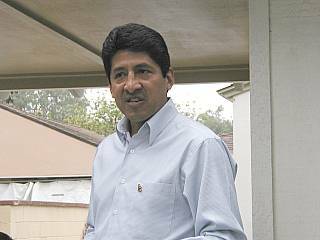 (March 9, 2005) -- Surrounded by family and friends, political and business associates, Randal Hernandez, formerly a senior aide to Governor Arnold Schwarzenegger and Chief of Staff to LB Mayor Beverly O'Neill, has announced that he is running for Mayor. 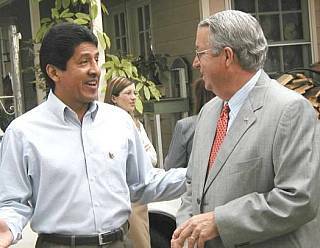 Mr. Hernandez, 46, (left side of photo) received the endorsement of L.A. County Supervisor Don Knabe (photo right), delivered a statement (transcript below) and fielded Q & A from reporters (extended transcript excerpts, below). Mr. Hernandez said he made his announcement outside his home to highlight his support for looking into creation of Neighborhood Councils (somewhat different than L.A.) which would communicate directly with the Mayor. When Beverly O'Neill first took office, as you recall this city was really in crisis. Jobs were leaving this city by the thousands, there was a crisis in confidence at City Hall and we were facing huge budget deficits. I was proud to work side by side with Beverly as her Chief of Staff in that first term, bringing people together to rebuild the city's economy, rebuild trust in government and tackle the budget problems. Now, ten years later, we can point with pride with the progressed that we've made and the foundation that we build in that first term in office. It's a foundation we need now to bring jobs to every part of this city, to ensure we have safe neighborhoods and safe schools, and to bring neighborhoods and city government closer together. The future of this great city is bright...but we must address the issues facing us today/ I'm concerned that the current City Council isn't working hard enough to fix our budget deficit or make the hard decisions to get more police officers on the street. We need action and we need it now. I feel so fortunate to live in Long Beach with [wife] Lynn and [son] Garrett. I also feel fortunate to have spent most of my professional life both in the business community and in city government working to make Long Beach better. And above all else, ensuring we have safe, healthy neighborhoods in every part of this city. You know, we wanted to do this event in our neighborhood because the strength of the city is the neighborhoods. Each one is unique and has different strengths and challenges. I want to look at creating a network of Neighborhood City Councils that directly connects with the Mayor so that we can discuss everyday how together we can improve the quality of life in Long Beach. Neighborhood Councils means bringing together local families, neighborhood businesses and community leaders together block by block to address the city's most pressing needs. I want to work with each of you and with families across this city to create a neighborhood agenda for the City of Long Beach. Over the next year, my plan is to engage our residents in a conversation about the future of the City. You know, what I learned most from Governor Schwarzenegger this past year is we can't be afraid to talk about the tough challenges, and most especially, that government doesn't have all the answers. We need to think boldly, and respectfully, of other people's views if we're really going to find meaningful solutions to some of these challenges facing us today. You know, I've been honored to work side by side with a Democratic Mayor and a Republican Governor. They've taught me a very important lesson: it's less about politics and more about getting things done. And, both Beverly and Governor Schwarzenegger have instilled in me an unwavering optimism about the future. I've learned a great deal from them. I've learned a great deal from all of you, as I look at the crowd, so many of you have touched my life and been great mentors to me and have been great partners, and I'm so appreciative of that. And I've worked with a lot of neighborhood leaders across this city as well, bringing people together to make this city better. I will make the hard decisions to ensure our city is safe for families and our young people. Q: You mentioned the need to get more police officers on the streets of Long Beach. Would you support an increase in the utility users tax? Mr. Hernandez: You know, the utility users tax should be the last resort, not the first reaction. I think we need to assure the public that we [the city] have done everything possible to squeeze every dollar out of the current city budget before you even consider the utility users tax or any other tax. Q: Where would you stand on the modernization of the Airport? Mr. Hernandez: You know, I think people need to remember that, number one, this Airport isn't going to go away, and number two, that 41 flight cap is solid. Somewhere in the middle we need to come up with a community consensus to make a modernization plan that works for everyone that is focused not only on adequate facilities but also appropriate security. And I think we need to remind ourselves that the Airport, whether we like it or not, is part of the national transportation system, and if we don't come to a community consensus here today soon, we stand a chance of losing jurisdiction over the Airport, and that's the worst of all worlds. Q: Do you support the Council's recent vote? LBReport.com: I was just trying to get at, do you support the Council's action in putting the alternatives where they put them? Mr. Hernandez: Well again, I wish they would have looked at more alternatives along the way. Mr. Hernandez: Well, the initial recommendations that came from the city manager because remember, this was not the decision of what was the final thing going to look like, just what are the scope of the size of the facilities we want to take a look at, and that's all that they were being asked to do. Now we've kind of squeezed it down a little bit. I give [8th district Councilwoman] Rae Gabelich a lot of credit for taking the leadership to find something that was good for her constituencies. LBReport.com: Are there policies of the O'Neill administration with which you disagree? Mr. Hernandez: You know, Beverly and I see eye to eye. When I came to Beverly's office, remember the most important thing we had to do was rebuild the city's economy. She tells the story, thousands of jobs leaving, literally had to rebuild the economy. That's not a Republican thing, that's not a Democrat thing, that's something that really happened here in Long Beach. Do we have disagreements on how we would have done that? No. I think probably the biggest difference between Beverly and I is just our personalities and how we would go about it. Q: Back on the Airport. Do you subscribe to the belief that modernizing, or perhaps expanding the terminal, could jeopardize the city's ability to maintain 41 flights? Mr. Hernandez: I feel really confident that the 41 flight limit right now is rock solid. But we also, again, have to be realistic that that's an aging facility, it wasn't meant to accommodate 41 flights, and I just took a walk through there over the weekend. It's in pretty bad shape. It's almost embarrassing. And that's the first image that a lot of people see coming to our city. Do we need some tremendous, glorified airport? No. We just need something that's at least presentable. LBReport.com: Do you support the Port's [Port of LB] Green Port policy and would you favor creating a Task Force similar to the one in L.A.? Mr. Hernandez: Well I'm glad to see that the Port is taking steps toward being more sensitive toward environmental issues, but I think what we need to do is not only look at the Port only in terms of its emissions. We have to take a comprehensive look and talk about how the emissions affect transportation congestion, things like homeland security, job training, so it's really taking a look at what's going on at the Port. It's an important job generator, and we need to protect that, but we also need to balance it against some of these other areas. And again I think it's one of those things that we need to bring people together, not just people here in the community but this is a statewide and a national asset. We need to bring the state to the table. We need to bring the federal government to the table, and try and find solutions that are driven by good science and good transportation. But I think the Port is heading in the right step in doing the Green policy and remember, that the...proposal that came out of the community hasn't been fully approved yet by the City of L.A.? LBReport.com: Would you support creating an L.A. style Task Force here? Mr. Hernandez: You know, I'd have to look at the Task Force report first. I think that's a good starting point, to take a look at what's in their report already. Obviously, I've built a good network in the people I know in Sacramento, the Air Resources Board, the Secretary of EPA. the Secretary of E,T & H, I've worked closely with all those individuals and even before I left and decided to run for Mayor, I had discussions with each of them and said, you know, there needs to be a way that the state should get more involved in this issue because, again, the Port of L.A. is not just about L.A., the Port of Long Beach is not just about the Port of Long Beach, it's bigger than that, and we need to bring all those stakeholders together. 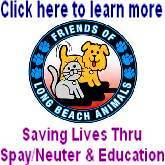 LBReport.com: The Council twice endorsed, the Council did, [Alan] Lowenthal's No Net Increase bill and the Governor vetoed it. Was the Governor right or the Council right? Mr. Hernandez: I think Alan's trying to do the right thing, but when you pass legislation like that, I think we need to make sure that it's going to be effective and not just put out false hopes. I think the Governor was in the right place again to say, you know we do have problems here...[and] these are issues that are not just these ports [LB and L.A.], the Port of Oakland is having those same kind of problems, the Port of San Diego, so I think the Governor took the right step in saying 'you know what, we need to look at this thing more globally and beyond the Ports of L.A. and Long Beach' but that's where it starts because that's where the most job generation and most traffic is going through right now. Q:: While we're on Port issues, the [proposed] LNG [Liquefied Natural Gas] terminal, what is your position on that? Mr. Hernandez: You know, we need -- and the Governor talks a lot about this -- we need to find reliable, low cost sources of energy. It affect everything we do every day. But I'm anxiously awaiting to see what the results are of the report, the analysis that's going on right now, to see what are the pros and cons of it. We need to better understand what are the benefits to the community and what are the risks to the community before we make any decision. But above all else, that decision should be made here in Long Beach. I am adamantly opposed to Congress trying to step in and take the jurisdiction away from the city. We have to make that decision here. LBReport.com: Are you comfortable with the non-elected Harbor Commission making that decision as opposed to having the City Council do that? Mr. Hernandez: Well hopefully there's some cooperation and coordination between both of them in that process, and it should be, I mean we're all one city. It's not the Port against the City of Long Beach, we're all part of the same city, so again it's that collaboration along the way. And I think you're seeing it on both sides, I think last night, what the Council tried to do was indeed say we want to work closer with the Port of Long Beach as they should. LBReport.com...To follow-up on [an earlier question about the utility tax], you said you didn't favor raising the utility tax unless all the waste and fat had been squeezed out of the budget, words to that effect. Has it been done? Mr. Hernandez: I don't think so. That's what I talked about in my remarks. I don't think the Council has really made the hard choices. They've done a good job of getting through the three-year rolling plan, but I think now we need to dig deeper. I mean that presentation that [LB Police Chief] Tony Batts made was so compelling, and if it didn't inspire that Council but this community to say you know what, we better start taking a hard look at the way the city operates and see what we can do to not only speed up more dollars for more cops, but pay the ones that we have a fair wages. And if that's this community's top priority, and I think it is, then we better start looking at making some hard choices and it is going to mean making some hard choices. Mr. Hernandez: [concluding remarks] I hope you guys see this is a campaign about neighborhoods...One of the key reasons why I'm running is because of my son Garrett, and because of his friends. I want to make sure that when he goes for a bike ride with his friends...that they feel safe riding their bike along these streets. That we all feel safe if we go to the neighborhood parks. I want them to grow up in a community they feel proud about and feel safe and secure. And the decisions we make right now, today, are going to determine whether or not we're going to meet those goals. So I'm in this for the long term. I'm taking stuff away from my career in the public sector because I really am serious about the future, and that's not just over the next two election cycles. It's a future ten, twenty years out, so when Garrett raises a family hopefully here in Long Beach, he feels part of the decisions we made this year, next year, and the year after that. Jane Netherton, President/CEO of International City Bank and member of LB's Redevelopment Agency Board, was present at the event and a spokesman for the Hernandez campaign told LBReport.com that she has endorsed Mr. Hernandez. Friends and acquaintances who attended the event but have not endorsed included City Prosecutor Tom Reeves and Verizon Communications External Affairs Manager Mike Murray. Mr. Hernandez began the City Hall aspect of his career as an aide to former 8th district Councilman Jeff Kellogg. He went on to serve in high ranking capacities with the LB Area Chamber of Commerce before becoming Mayor O'Neill's Chief of Staff (1994-99). Until recently, Mr. Hernandez was Governor Schwarzenegger's Appointments Secretary, a powerful post overseeing the process by which the Governor appoints individuals to state offices. He's currently Senior Government Relations Executive for Bank of America. 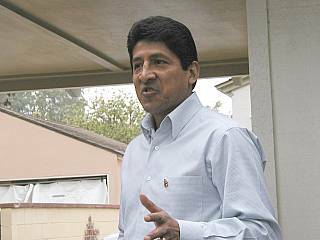 Mr. Hernandez becomes the second person to announce he's seeking the Mayor's chair being vacated by in 2006 by three-term incumbent Beverly O'Neill. 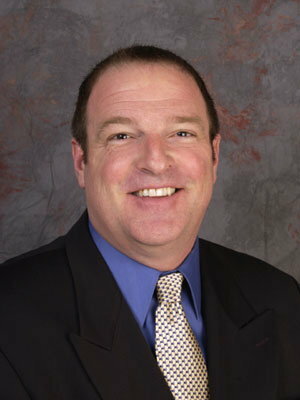 Retired LB Councilman/Vice Mayor Doug Drummond, elected to LB's 3d district Council seat after rising through LBPD's ranks from beat cop to Commander, was the first to announce his candidacy for Mayor in January 2005.